Thousands have filled the streets of Hong Kong in the past few days calling for true democracy in the run up to 2017 elections in the Special Administrative Region. But their calls have been largely ignored by both Beijing and the Hong Kong governments. Beijing has called the protests illegal, and stirred up by hostile western forces. Meanwhile authorities in Hong Kong have struggled in how they might respond to the protests which have swelled, drawing tens of thousands onto the streets. 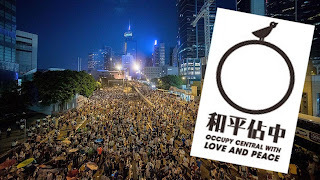 The Occupy Central protests have been largely peaceful, but tensions boiled over late Sunday evening local time with police firing volleys of tear gas into the crowd. Such displays of force, especially on a peaceful group of demonstrators, is relatively unprecedented. Tear gas has only been used in Hong Kong once in the last decade under Chinese rule, but is was also used under British colonial rule during the 1967 riots. Its use has been criticised by the protesters and some western media outlets, especially given the mostly peaceful nature of the demonstrations. However Chinese media has said the police have shown "restraint" in the face of "illegal" demonstrations aimed at bringing chaos and which "ruin the image of Hong Kong" [Global Times / Xinhua / Global Times / BBC]. China has also ramped up censorship on the Internet [CNN]. Meanwhile Western media has largely remained neutral or sided with the protesters. As regarding the level of reportage, the protests have been ignored to a great extent both inside mainland China and outside Hong Kong. Few news stations in Britain gave anything more than a few minutes coverage to the demonstrations throughout the last week. However following the volleys of tear gas late Sunday CNN scrubbed regular programming and gave up more nearly 12 hours of coverage almost entirely to the Hong Kong protests. The same was not true of other major news outlets. Sky News, the BBC news channel, Al Jazeera, RT and France 24 only occasionally dipped into the events on the ground. On Monday the story topped headlines on CNN, France 24 and Al Jazeera, though due to the Conservative Party conference in Britain the story was pushed to one side on the BBC and Sky News. The impact of the demonstration has affected business across the important global financial centre. The Hang Seng lost some 2% in the day and some 44 bank branches were closed. Since being handed back to China in 1997 Hong Kong has been a Special Administrative Region, ruled under a so-called "One country, two systems" policy. However, there are fears amongst its residents that in the future the region will be swallowed up by the mainland, essentially becoming one country with one policy that covers the whole region. In 2017 there will be more open elections, but the way candidates are chosen and ratified by Beijing, has angered people in Hong Kong who say this does not come up to their expectations of true democracy. While there is a great deal more freedom in Hong Kong, 15 years after the handover from British colonial rule many Hong Kong residents fear that China is reneging on its promises. With only 12 hundred people eligible to vote in a city of 7 million, residents are calling for a bigger say in the war the Special Administrative Region is run. Beijing says that it has considered a real election allowing everyone to directly elect its leader by 2017 and legislators by 2020. Although full universal suffrage was never granted by the British to its colony before the handover in 1997, some democratisation began in 1984. However little has changed over the last 18 years despite countless protests calling for greater democracy in the region. However, mainland China has maintained a firm grip on power over the SAR and many of the political candidates are hand-picked by Beijing. In the Hong Kong Chief Executive election of 2012 Albert Ho Chun-yan stood little chance in being elected. He faced off with two pro-Beijing opponents, Leung Chun-ying and Henry Tang. Both were backed by the Chinese Communist Party, and there are widespread allegations that Leung himself was even a member. Both have also been accused, by opponents, of being involved in various scandals ranging from extra-marital affairs to corruption. As the electorate, consisting of only 0.02% of the Hong Kong population, went to the polls in March, others held their own mock election to protest the lack of true democracy [Al Jazeera - YouTube] . But such protests fall on deaf ears, and are certainly not reported in mainland China. And with most of those voting showing loyalty to Beijing it was no surprise that Leung clinched the leadership role. But while these new protests may unnerve Beijing, but they are unlikely to cave in to the protesters demands. In accordance with the "One country, two systems" principle agreed between the UK and the PRC, the socialist system of PRC would not be practiced in the Hong Kong Special Administrative Region (HKSAR), and Hong Kong's previous capitalist system and its way of life would remain unchanged for a period of 50 years until 2047. In fact while much of the focus has been on 2017 and the next Hong Kong elections, 2047 is also a significant milestone. Will the freedoms currently enjoyed in the region be eroded? And will business be affected? There may certainly be a drain of confidence in the markets if protests continue, but there are also concerns for the future amongst those that do business in Hong Kong. Indeed the uncertainty of what will happen after 2047 is clearly an issue for those that do business in Hong Kong. The protests have spread across much of Hong Kong and beyond the central business district. This will be of concern not only for Hong Kong authorities but also for Beijing who will be worried that any concessions may spark protests for democracy in mainland China. The protests may have been largely peaceful, but the world will be watching closely worried perhaps that the continued demonstrations could precipitate a response similar to the Tiananmen Massacre of 1989. Is Britain now a Disunited Kingdom?